As the return of turmoil to the Italian market has demonstrated, the decision by the current Italian government to target a deficit of 2.4% of GDP in each year through 2021 constitutes a meaningful deviation from the commitments made by the previous government to the European Commission of a projected deficit of 0.8% in 2019. The news sent BTP spreads back to the top end of their range since May, with today’s 10-year yield reaching a local high of 3.4%, surpassing the May highs. 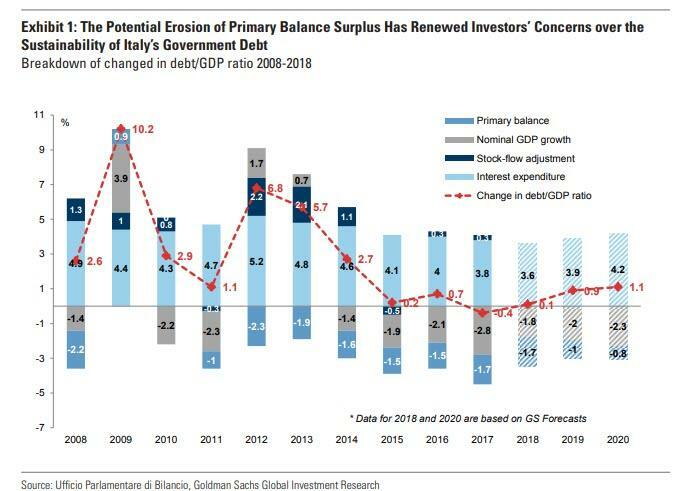 First, the planned fiscal expansion, while not extreme, is sizable enough to renew investor concerns about the long-term sustainability of Italy’s public debt stock, in large part owing to the expected deterioration in the country’s primary surplus. A lower primary surplus increases the vulnerability of the economy to growth and market shocks, and worsens the outlook for the public finances, especially when the stock of public debt is already elevated and growth is unlikely to benefit much from fiscal easing owing to a low fiscal multiplier. The parliamentary budget office reports that, cumulatively over the past eight years, the government primary surplus has reduced Italy’s debt-to-GDP ratio by approximately 11.5 percentage points. Positive growth and lower interest expenditures (compared with 2011-2013) have also supported the stabilization of the Italian debt level over the past few years (Exhibit 1). With a lower expected primarily surplus, higher funding costs and soft economic activity, considerations of long-term debt sustainability pose a challenge to forward debt/GDP dynamics, and have meant investors have required a higher risk premium on Italian government bonds. Second, the increase in government funding needs stemming from a higher public deficit comes in conjunction with the slowdown and forthcoming end of the ECB’s net asset purchases. The's ECB quantitative easing program initiated by the ECB in March 2015 is coming to an end this year. Since its initiation, the central bank has purchased €360bn-worth of Italian government bonds and we expect it to buy another €5.5bn in the last quarter of this year. 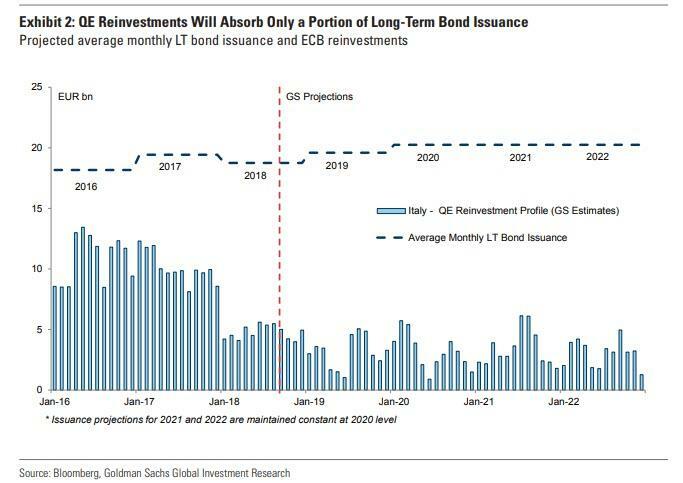 From January 2019 onwards, Goldman expects new purchases to end and reinvestments of the Italian government bond portfolio to average EUR3-3.5bn/month in 2019 (Exhibit 2). Over the past few years, ECB buying of medium-/long-term debt has allowed the Italian Treasury to increase the average life of government debt by approximately 0.5 years and to bring it back to levels seen before the global financial crisis. Despite an increased reliance on term debt, the Italian Treasury has to roll over approximately EUR400bn in securities per year (including short-term securities). With ECB demand diminishing, the increase in supply to the private sector will likely represent an additional headwind to BTPs. Third, heightened market volatility in recent months may have had lasting effects on BTP liquidity and market depth. In Exhibit 4, Goldman shows the average daily volumes of Italian government securities on cash secondary markets (M.T.S.) during April, May and June 2018. The volumes of BTPs exchanged in June, following the selloff of Italian bonds initiated at the end of May, have been almost one-third of those observed in April and May. While these data refer to a few months ago, the collapse in volumes, accompanied by a meaningful increase in bid/ask spreads (Exhibit 5), point to a potentially severe deterioration of market liquidity, which in Goldman's view has resulted in increasingly gappy price action. While the broader market seems to have partly moved on from Italy’s risk and international financial spillovers have been relatively muted thus far, we believe the current situation is an unstable equilibrium. After all, the new budget proposal will likely increase the odds of negative reactions from Brussels and rating agencies, and consequently the risk of additional volatility and curve flattening pressures.